GALION –A fast start got Cardington out to a 17-point lead over Northmor in a game they would go on to win by a 49-20 margin to spoil the Knights’ Homecoming festivities Friday. Even though Northmor was able to battle back to close the gap to a 24-14 margin early in the third quarter, the Pirates were able to control the field position battle for much of the remainder of the game, as they quickly added to their lead on their way to claiming the win to improve to 4-2 overall, 3-1 in the league. Northmor is still looking for their first win of the 2016 season. Cardington got the ball first and wasted no time in scoring, going 72 yards on eight plays. Quarterback Luke McCarrell took control of the offense, running for gains of 10 and 16 yards, while also completing two passes to Nate Craig, as well as a 40-yard scoring strike to Daniel Kill that staked the Pirates to an early lead. Branden Steckel’s extra point made it 7-0. After the teams traded punts, Northmor looked to get their own scoring drive, as Jordan Wiseman hit Kolton Smith for 29 yards to put the ball into Pirate territory. 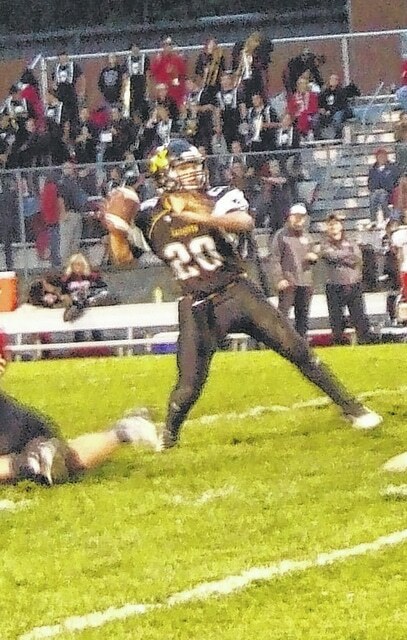 An 11-yard run by Conan Becker moved it to the 26, but the drive would stall, giving the ball back to Cardington. The teams would trade punts again, but Cardington would score on their first possession of the second quarter. Despite starting on their own 14, the Pirates only took five plays to score, as McCarrell connected with Garrett Wagner three times, including a 62-yard touchdown pass to take a 14-0 lead. After forcing another punt, Cardington got a 29-yard field goal by Steckel to add three points to that margin. Northmor coach B.J. Trainer noted that the margin could have been a lot closer at this point, but a couple passes that could have gone for points weren’t held onto by the intended receivers. The Knights were able to make plays late in the second quarter. Starting from their 32 with 4:42 remaining in the half, three running plays moved them to the 41 and Wiseman then hit Demetrius Johnson for 32 yards. Three plays later, the senior quarterback struck again, connecting with Smith for a 27-yard score. Kyle Kegley’s extra point closed the game to a 10-point margin with 1:28 to play in the half. Unfortunately for the Knights, it would only be a 10-point margin for one minute, as Cardington returned the kick to the Knight 45 and then McCarrell completed four straight passes for a score. Devin Pearl caught three of them, including a 3-yard scoring pass to send the teams to the locker room with Cardington in front 24-7. Northmor struck back to open the third quarter. Johnson took the opening kick to the Pirate 38. Passes by Wiseman to Johnson and Garrett Gillispie moved the ball to the seven. Then, facing fourth-and-goal from that spot, Wiseman called his own number and scored on the ground to bring his team back within 10 points. The rest of the quarter would belong to the Pirates, though. Facing a short field again after returning the kick to the Knight 49, Cardington drove down the field and got a four-yard scoring pass from McCarrell to Pearl. Northmor would then get pinned deep in their territory and moved backwards on their possession, leading to a punt that was downed on their own 36. Cardington took advantage of that short field, scoring on a five-yard run by McCarrell. After the PAT snap wasn’t handled, Kill then picked up the ball, scrambled and tossed it to Skyler Bowling for two points, giving Cardington a 39-14 lead. Northmor wound up pinned deep in their territory again and, after going three-and-out, punted it out of bounds at the Knight 49-yard line. This time, after four runs by Kill moved the ball to the four, the drive stalled, but a Steckel field goal ended the third quarter with Cardington in front 42-14. Northmor fumbled early in the fourth quarter to set up a short scoring run by McCarrell that made the score 49-14 and caused the clock to continually run for most of the period. The Knights would score late in the game on a pass from Wiseman to Smith after blocking a Pirate punt, but the game would end shortly after with Cardington on top. Despite winning, Williams feels his team has room to improve. Luke McCarrell looks to get a pass off before the rush of Northmor’s Sam Eichorn arrives. Jordan Wiseman gets ready to go deep for Northmor against Cardington Friday.